It's been a doozy of a week. Not in a bad way, but very very busy. Appointments, things to do, people to see, work to finish, and on and on. I'm finally feeling more myself and am very much looking forward to a fun weekend with CC. In the meantime, today is a very special day. Today is the day we can begin celebrating the only true holiday in August. I mean, it's on my calendar. I assume it's on yours since you're so smart. 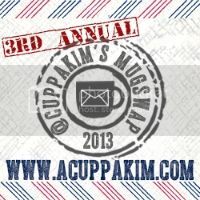 Kim's third annual mug swap is upon us and sign-ups begin TODAY! I'm already signed up. Because come on! She threatened to close sign-ups early if it gets too out of control. I refuse to be left out of the most awesome goodness celebrating mugs and coffee and tea ever. You better get over there and get on the list! The first year she had about 30 folks do it. Last year- over 240! For real, she doesn't play around. Join in on the fun! I can't wait to see who my new friends will be this year! If you post on social media, be sure to use #mugswap2013 so we can all celebrate this holiday together. Fun times! hahaah. i'm glad the mug swap is as special to you as it is to me. ;) and i'm glad you signed up early.